Caper bud or caper berry? When I mention capers, do you instantly think of the smaller preserved flower bud or the juicy berry? Jonathon Trewartha and his family lease caper plants to farmers. He planted the first Australian caper farm in 2004 to provide local farmers with the opportunity to use land that may be unsuitable for other crops. Caper plants are drought-tolerant, can grow on the dry rocky slopes of the Murray River. They don’t need much looking after so why don’t you have a go at growing one in your garden? The bush will grow about 60—70 centimetres tall. Small, plump and dark green in colour, capers are the preserved flower buds of the plant which are harvested and brined before the blossoms pop open. The curing brings out their tangy lemony flavor, much the same as green olives. If you decide to let the plants flower, the edible fruit known as caper berries will develop. March is the end of the picking season in Australia. The berries make their way to Mannum, where Jonathan is based. The Mannum area, on the banks of the Murray in South Australia, is about 80 kilometres east of Adelaide and subject to long, hot and dry sunny days and low rainfall. It also has reasonably well-drained soils. 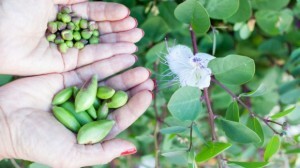 The caper buds are treated as a delicate herb, being taken from the field to the table in only a few steps. Jonathon says this maximizes the retention of natural flavours by minimising oxidation from the air and exposure to heat. “I feel that the knowledge of using locally grown Australian capers and caper berries adds to the enjoyment of eating them, particularly because they are a plant requiring very little of Australia’s precious water and can grow in the poorest soils. You’re eating the herb, the leaf or the fruit of a plant that not only creates vital rural jobs but is also environmentally sustainable. For the first time, Australians can enjoy the delicate fruity flavours, the sweet herbal aromas and the fresh firm crunch of locally grown organic capers,” says Jonathon. When choosing capers, Jonathon suggests looking for the white marks on buds and berries. Store capers with other herbs and berries in the fridge, and to reduce saltiness, rinse under gentle running water for two minutes. Soak to taste for 5 to 30 minutes. Check out the ‘Cucumber ribbon salad with olive and caper dressing’ on page 38 of my ‘From Paddock to Plate’ book.